It’s well known that when entering a country you must declare goods that you have purchased overseas, but keeping a detailed record of each and every item can be hassle when all you want to be doing is enjoying the trip. Actually, though, it needn’t be… thanks to today’s technology, the task of recording all your purchases – regardless of currency – is easier than ever before. 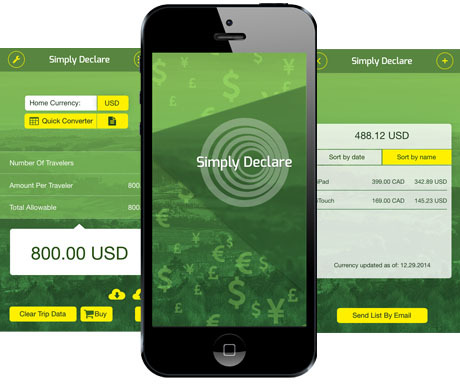 Simply Declare is the only app on the market which is designed to deal specifically with handling your duty-free allowance purchases for declaring back to your home country. It is an iOS travel app which has gone through some major changes with their latest redesign. Available in either a basic free version or in an enhanced paid version, it deals with one of the hassles of paperwork while travelling – that of documenting your purchases whilst you are away. The simple, user-friendly interface is slick with some very intuitive features. This app is made to go from any currency to any currency, and in real time currency keeps you abreast of the amount of your purchases in your home currency. It even has the ability to work with multiple currencies within the same trip. Simply Declare Travel App FREE is the basic version, which will track your purchases but with a limited 34 supported currencies. Although these 34 currencies are the major currencies, you will have to upgrade to the paid version for the ability to expand to the full 165 currencies, including Bitcoin, if you are travelling to other locations. The free version has some advertising on it but it is not overly intrusive. By upgrading to the paid version, you can lose the ads and tailor the app to your own needs. The extra features of the paid version also include a handy notepad which can be used for things like packing lists, as well as an “item” notepad to make notes alongside individual items. But one of the best features is the Quick Currency Converter which alleviatse the need to have two apps on the iPhone or iPad. By upgrading to the full currency list, the “favourites” function for being able to move your top 7 currencies to the top is useful. You simply have to tap the star and your currency is moved to the top. You can create your favourites currency list for your trip and the quick converter and items page will help you to streamline adding items to your roster. The paid version also integrates with the iCloud service to make sure, if you use the cloud feature, that your purchases are safeguarded against loss. There are in-app purchases for handling your reports and you can create individual user lists or a history of trips in case you want to keep your purchases for future reference. When you add an item, you can even take a picture of the receipt and you can email the receipt and the completed list for safekeeping. This is a solid, all-round travel app that provides an easy way to manage the task of making sure you have your paperwork and numbers ready to fill out the customs declarations forms when you return home and other handy traveller-friendly features. The look of the app is clean and crisp and it works on WiFi so you don’t have to worry about roaming charges. The developer has said it will eventually be available on Android, but for now it’s only for Apple mobile devices. Download the free version here or the paid version here. Let us know what you think! Oh now that makes sense. The amount of time London has lost our duty free declarations that we put in the boxes is ridiculous. Great idea! What will they come up with next? Anything that makes our lives easier, works for us and this one does. I still don’t know why people buy Duty Free items. Are products so much cheaper in duty free than buying it locally? I find that alcohol is about the same price in the U.S. than I see it in Duty free. We have a store in the U.S. that seems to have everything there :-). Besides its such a hassle now and you may have to pay for a bag, plus if you connect that makes it worst. But if you have to buy duty free, I could see the utility of this App. Neat find. To be honest I’ve never needed an app like this as I rarely buy much while I’m travelling, other than a few interesting cooking ingredients maybe. Although India was an exception – I instantly transformed into a shopaholic there but even then I doubt I was anywhere close to having to declare my purchases. I would imagine you could buy quite a lot of small items from India, Kat, without going over your allowance in the UK. The app allows you to check whether you are still within your allowance or not, and puts you in a position to be easily able to present details of exactly what you’ve purchased should you be stopped. You can bring in other goods worth up to £390 (or up to £270 if you arrive by private plane or boat). …so it’s really not a huge allowance, particularly if you’re buying one or two items of any significant value. What a clever idea. I am always scrambling for receipts as I fill out the form and this would keep everything so organized, especially when you have multiple international trips a year. I’ll check it out-thanks. Amazing idea.Technology has done our work so easy .Thanks for posting such informative posts. I always buy alcohol from duty free and we travellers really require these sort of apps to sort out the things asap.